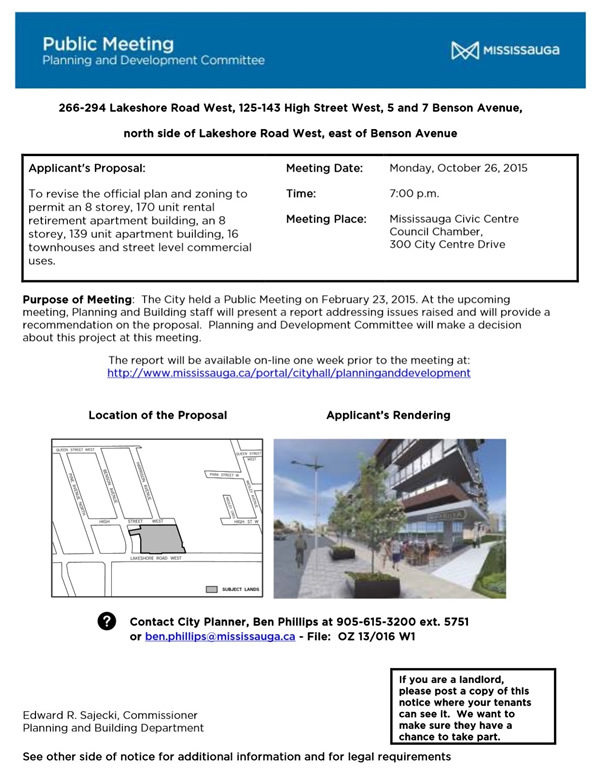 To revise the official plan and zoning to permit an 8 storey, 170 unit rental retirement apartment building, an 8 storey, 139 unit apartment building, 16 townhouses and street level commercial uses. Meeting Date/Time: Monday, October 26, 2015 7:00 p.m. The City held a Public Meeting on February 23, 2015. At the upcoming meeting, Planning and Building staff will present a report addressing issues raised and will provide a recommendation on the proposal. Planning and Development Committee will make a decision about this project at this meeting. If a person or public body does not make oral submissions at a public meeting or make written submissions to the City before the by-law is passed, the person or public body is not entitled to appeal the decision of City Council to the Ontario Municipal Board, or be added as a party to an appeal of the decision to the Board. If a person or public body does not make oral submissions at a public meeting or make written submissions to the City before the by-law is passed, the person or public body may not be added as a party to the hearing of an appeal before the Ontario Municipal Board unless, in the opinion of the Board, there are reasonable grounds to do so. The proposed Official Plan amendment is exempt from approval by the Region of Peel. The decision of the Council is final if a notice of appeal is not received on or before the last day for filing a notice of appeal. On September 30, Mississauga City Council approved a motion for the development of a beach volleyball facility on the City of Mississauga’s waterfront at Lakefront Promenade Park in Ward 1. The courts will be used for the 2016 Ontario Summer Games and will have an ongoing community legacy.